This project has been derived from this basic experiment. I recommend you to do the basic experiment before you go for this experiment. In this experiment, we use an Android smart phone to control the 3mm LEDs of the Amarino shield. Step 3: Stack Amarino shield over your Arduino and connect a Bluetooth adapter. Step 4: Connect your phone to Bluetooth adapter via serial emulator application. 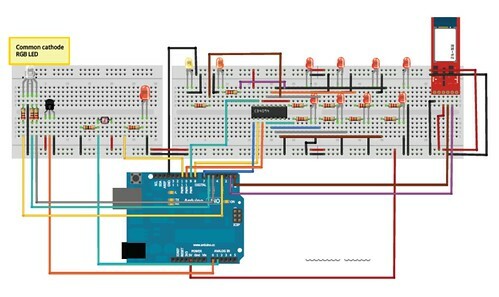 The following circuit layout shows a Bluetooth adapter (BlueSMiRF module) from Sparkun. You can use a cheaper adapter available at buildcircuit.net. Please note that there is no DIP switches shown on the figure below. a. General Bluetooth Adaptor – Cheapest adapter available at www.buildcircuit.net. b. BlueSMiRF- Bluetooth Mate Silver – More expensive available at Sparkfun.com. 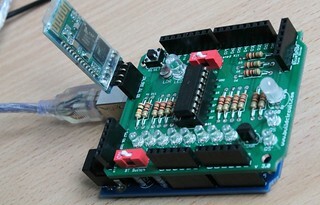 c. BlueSMiRF Gold – The most expensive, available at sparkfun.com. I don’t know if we can change the baud rate of general Bluetooth adapters with the above mentioned process, I have not tried it yet.